This quick and easy dessert recipe is a twist on a big crowd-pleaser. Simple and versatile, these cinnamon-dusted, bite-sized Stonefire® Naan Dippers® can be a mouthwatering dessert, a homemade snack, a movie night treat or a sweet sidekick to coffee and hot chocolate. Serve with salted caramel sauce immediately after cooking and watch them disappear. Heat 2 tbsp. of butter in a large frying pan. Add the dippers and toss them in the melted butter. 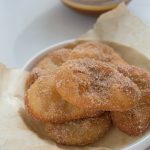 Sprinkle with cinnamon sugar and toss until they are coated on both sides. Serve warm with salted caramel dipping sauce.